One of the best surprises in life is to receive flowers unexpectedly and this flower bouquet is ready to delight your recipient with energy and light in honor of lifes most precious moments or for no reason at all, but to make them smile. 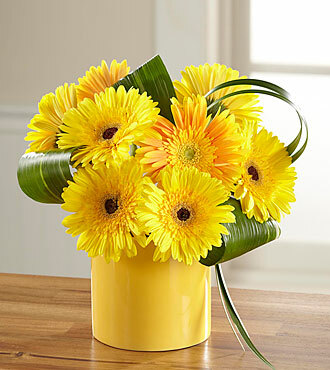 Vibrant yellow gerbera daisies and orange gerbera daisies are arranged to show off their bright, brilliant color and texture accented with lily grass blades, and lush tropical leaves situated in a yellow cylindrical ceramic vase. An unforgettable birthday, get well, or congratulations gift!